By Susan Tretakis – The irony of writing this nearly one year after Hurricane Irma pounded South Florida while the media reports on Hurricane Florence bearing down on close friends in South and North Carolina is not lost on me. I used to say that Hurricane Wilma in 2007 gave me an enhanced respect for Mother Nature when she decided to destroy my roof. Wilma also made me view thunder and rain through different lenses. I stayed here for Wilma, and woke after two hours of uneasy sleep to torn open hurricane shutters, no power, uprooted trees and blocked streets. Last year it was Irma, shown on every weather channel as “being larger than the entire state of Florida”. This was the picture I could not get out of my head. Overwhelmed, I knew only that I could not stay alone. Through the kindness of friends, I left South Florida for safety to another state, high in the mountains. Being a storm evacuee is not easy. What do I take? To this day, I remember the northward traffic, the number of Florida license plates traveling alongside us, and my uncertainty of what I would come home to, if anything. The night the storm hit South Florida, as physically safe as I was, I kept thinking of home: did I take care of everything I should have, did I have all of the necessary papers, what did I forget? What would I come home to – if anything? When I returned, I was one of the luckier ones. My home was still standing with minimal structural damage. While streets were closed from fallen trees and while my neighborhood was without power and under a boil water mandate for almost 4 weeks, I know I was fortunate. Both storms were terrifying; but I survived. So why do I still get frightened by tropical storms with thunder, lightning and torrential rain? Writing now, in a state where the sun shines, why am I experiencing the same heartache, the same fear, the flashbacks of costly cleanup, when a similar storm is elsewhere? Was it the article in today’s paper that reported, “Hurricane Florence is now larger than the state of South Carolina”? I lived in South Florida through the chaos wrought by Hurricane Andrew – but these last two storms, combined with the devastation in Puerto Rico – marked my soul with black ink. In May of 1970, I was protesting against the bombing of Cambodia at Kent State University when members of the Ohio National Guard open fire on students in Kent, Ohio. I vividly remember what papers reported as “67 rounds of fire by twenty-eight guardsmen over a period of 13 seconds, killing four students and wounding nine others.” I can easily replay the soundtrack of gunshots and screams in my mind. In April of 2002, one of my Business students, aged 22, was “shot in the stomach as she exited her car in the school parking lot. Her family confirmed that she was being stalked by an obsessed ex-boyfriend and court records showed an active restraining order.” A student during the day, a waitress at night, my student was also the single mother of a young girl who turned 4 the day her mother died. In 1970, I was a hippie junior in college. I came home a different person; I used to say that Kent State made me grow up but I continued “minoring in protesting” as my father used to say to anyone who would listen to him. In 2002, I immediately flew into action to comfort students and teachers. I answered numerous questions from police and attorneys. I made condolence calls and went to court to testify. Both of these experiences were quickly and quietly filed away in the file cabinet of my mind, or so I thought. I was tough, or so I told myself. That file drawer imploded on February 14, 2018 with the shooting at Stoneman Douglas, my neighborhood high school. 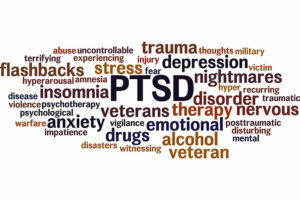 Most people tie the phrase “post-traumatic stress disorder” – PTSD – to the military; indeed, there is a valid and horrific connection. However, PTSD is now a valid cause of concern for non-military personnel; it’s become an undeniable part of life. In retrospect, I see now that I spent a great deal of time burying disturbing memories. I attempted to bury my inner thoughts critical of my responses, which only made me feel more uncomfortable and unhappy. I drank far too much and took far too many prescriptive anti-anxiety drugs to block out both my negative thoughts and hopelessness about the future. I detached myself from many people – some well-meaning, some just inquisitive. I was just too tired to decide to which group they belonged. I was unnerved at how thunder – a fact of life in South Florida – could freeze me in a second. I found that while I could counsel survivors of the MSD shooting in my neighborhood, I could not watch the news or read the papers about other shootings. I felt I had to be on guard at all times and worse, I felt that as a mental health practitioner, I could not admit my shortcomings to anyone. After all, I was the “strong one” the strong, go-to friend / neighbor / colleague. Thank goodness for Acupuncture and Traditional Chinese Medicine. Most PTSD therapies include trauma-focused cognitive behavioral therapies as well as treatment with various FDA-approved drugs covered by most insurance plans. It’s unfortunate that complementary and alternative medicine interventions are not recognized by insurers. Luckily, they are being recognized by the sufferers. Acupuncture is commonly recognized as a mainstream alternative. Well-tolerated by patients, Acupuncture has demonstrated a positive effect on PTSD patients. Acupuncture works by regulating the flow of Qi, or Life force, in the body. Acupuncture can be used on children, adolescents, and adults of all ages. Students hiding in closets during an actual school shooting or practicing random and just as frightening “safety drills” can be successfully treated. Teachers and administrators charged with the responsibility of keeping students safe from the unknown and the unexpected can also be successfully treated. Survivors of crimes, or horrific personal experiences can also find relief. Even certified and qualified psychologists can find relief from paralyzing fears with acupuncture. 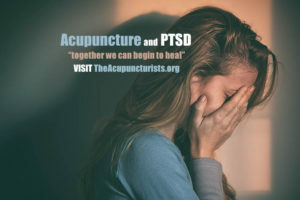 “Acupuncture treats PTSD by harmonizing the underlying energetic imbalances that cause the condition. PTSD is treated as a state of shock that must be cleared out of ones nervous system and body. Shock can linger longer after the event occurred. 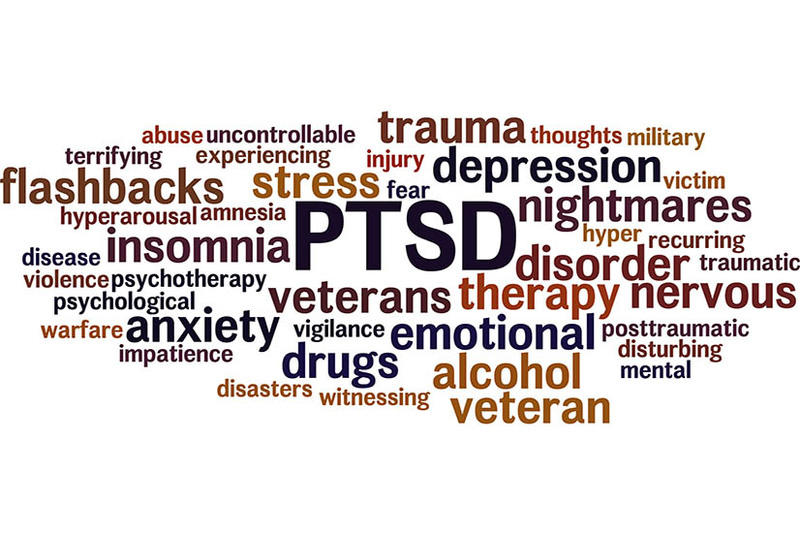 PTSD symptoms may re-occur when a ‘trigger’ – be it a memory, a phrase, a sound or even a smell occurs. With a strengthened, balanced Qi, the body learns to adapt”. You can fight the hold that these emotions hold over you; Traditional Chinese Medicines teaches you to acknowledge your survival as it strengthens your resiliency. TCM reminds us that PTSD is not that we are refusing to let go of the past, but that we understand that PTSD is the past refusing to let go of the person. Acupuncture and Traditional Chinese Medicine can help unlock those chains. Trust me on this. If you or a loved one are suffering with PTSD you owe it to yourselves to give us a call. We can help! Our skilled acupuncturists serve the South Florida Communities of Coral Springs, Coconut Creek, Margate, Tamarac, Parkland, Deerfield Beach, Pompano Beach, and West Boca.